4 Channel Network Video Recorder with built-in PoE ports for use with 2 megapixel IP cameras, 3MP IP cameras, 4MP IP cameras, and 8MP 4K security cameras that are PoE (Power over Ethernet). This network video recorder will store video from up to 4 IP cameras, at resolutions up to 8 megapixels. The important point is that this NVR has PoE ports which will also power the cameras, thus there is no need for having a separate PoE switch. There is no need for an external power supply as the built-in 4 port PoE will power all 4 cameras as well as transmit video. Just plug each camera via CAT5e/CAT6 cable and you now have a self-contained High Definition 4K Security System. It is required that you use compatible PoE IP Cameras. All of the cameras we sell are compatible for use with this NVR. The 4 camera NVR is standalone or self-contained because you do not have to connect it to a computer. It is a computer itself, and comes with its own embedded processor and Linux Operating System which stays virus free. It will never need any maintenance from a computer IT person, saving you a lot of undue costs. It has a friendly easy to use graphical user menu that can be controlled using the included mouse with point & click. It has HDMI and VGA video outputs so you can view your HD security cameras on a HDTV without any loss in video quality. It even supports IP cameras with audio and can record sound from cameras with microphones. When viewing your cameras, you can view 4 cameras in a grid, or view each camera in full screen mode. 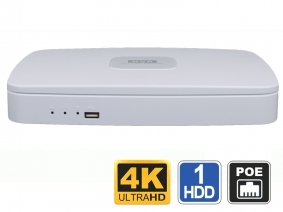 This 4 Channel PoE NVR comes with 1 SATA port for 1 hard drive up to 6TB in capacity. If you need more room, you can set some or all of your cameras to record on motion detect only. It also has a USB port so you can connect a USB DVD burner or external hard drive to back up your footage. You can also back up video via FTP. Be sure to use our security video calculator to determine which hard drive size is best for you. This NVR comes with Free Technical Support from our team based in the USA. All the cameras we sell at CCTV Camera World are compatible with our NVR recorders, Hybrid DVR, and Tribrid DVR. If you are looking for compatibility with cameras purchased elsewhere, please be sure to review our IP camera compatibility list. Dimension (W×D×H) 8.1" x 8.1" 1.8"
I am looking at the NVR04WP NVR, for viewing this remotely do you need to have a DDNS? Use off DDNS depends on whether you have a static or dynamic ip address for your internet connection. We do not recommend using a P2P service as it is not secure. We focus on professional systems, and P2P QR code based remote viewing is not secure and unreliable. Please review information on our Remote Viewing and Networking for security cameras section for more information about how our systems work. You can also find information on how to set up free DDNS for your system here. In regards to SKU: NVR04WP (4 Channel Network Video Recorder with POE). If I buy without hard drive, I can just add one and get started? The software is in built into the hardware, not the hard drive? Yes all of our NVRs and DVRs have a embedded Linux operating system which allows the recorder to operate even without a hard drive. You can add a SATA 3.5 inch hard drive at any time to start recording. Does this come with a free DDNS or do I have to pay for my own? We recommend using a Free DDNS service provide like no-ip. what is the power supply that comes with the unit? What is the power requirements for the NVR/DVR NVR04WP? We are looking to use at a remote location with 24V DC power available. This NVR comes with a 110V AC to 48V DC Power Adapter. All PoE NVRs have a high power requirement and cannot be powered with 24V DC Power. What is the software used for remote viewing (on the network)? What OS is compatible? Is your 4 Channel NVR PoE 4K H.265 H.264 SKU: NVR044K compatible with my Pulse Indoor/Outdoor HD Mini Dome Camera model #MDC835? The Pulse series cameras are not compatible with our security camera NVR as they are a proprietary cloud based camera from ADT. Using a router and access point, can this be used with the WD3MP wireless cameras? 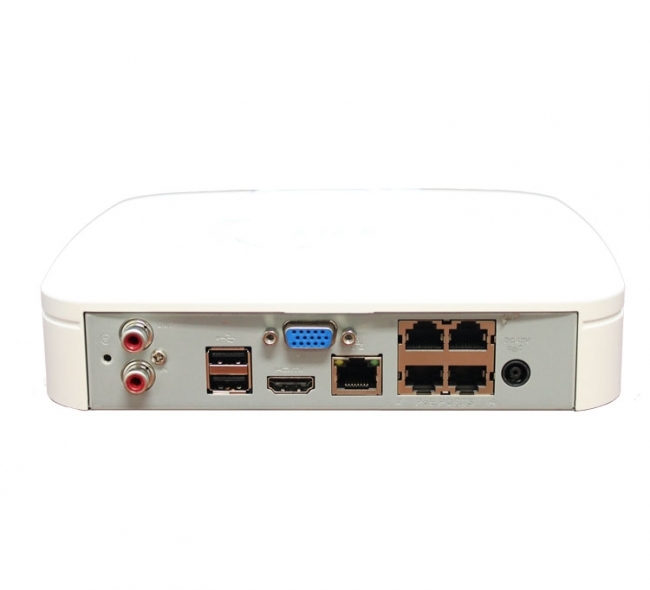 Yes any of our NVR can be used with an access point to connect to any of our IP security cameras. Can an external hard drive be plugged into this NVR for additional backup recording? An external hard drive cannot be plugged in to any NVR to extend recording time. You can use a USB flash drive to backup short increments of video only.